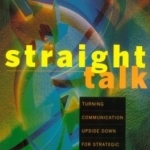 During a speaking tour, Eric Douglas was signing books at a Barnes & Noble in New York City when a slender woman approached and asked whether he might autograph a copy of Straight Talk® for her husband. “He’s in banking,” the woman said. “I think he might enjoy your message.” Six months later, the husband contacted Eric and asked if he’d like to do some work for his bank. The husband was a chairman of HSBC Bank. He invited Eric to come and do a workshop for his senior management team in New York. That assignment grew into a series of workshops in several areas of the bank, along with executive coaching. For several months, Douglas and his team from Leading Resources, Inc. worked with HSBC to coach them on the dynamics of teams and different management styles that the bank manifested around the world. As part of the engagement, Douglas asked each team to complete LRI’s team assessment, which provides a snapshot of how well each team is doing. Over time, the bank showed improvements in several key areas, most notably the effectiveness of the senior management team in communicating up, down and across the organization. Read more Case Studies or view Examples of Client Experiences.